We had a wonderful day today visiting some of the young entrepreneurs who are benefitting from our Youth Entrepreneurship Programme. Back in November, we ran a Dragon’s Den style training event here in Malawi and from that, 11 young people have received business loans and mentoring support to help grow their businesses. Hippo used his loan to but a Futurepump to help with his farm. He grows vegetables for local markets and, with irrigation, he can now get vegetables all year round and therefore a higher, more consistent income. We are delighted that Hippo’s farm is now going to be a Demonstration Farm where other people can come and see the pump in action and understand the benefit that it brings. Our next step was to visit Moussa who is raising quails and selling them to the local supermarket. 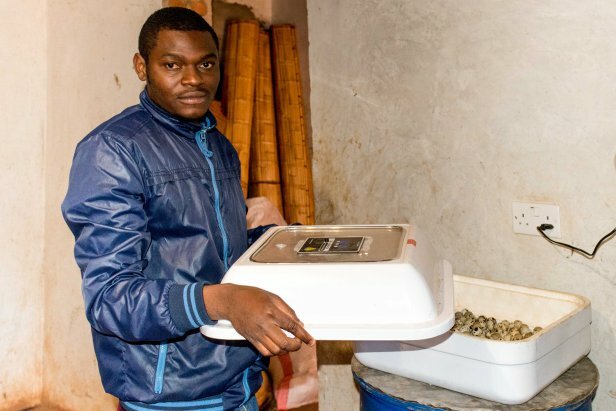 Demand outstrips supply so he is keen to step up production so he used his loan to buy an incubator and to extend his bird cages. Because of the challenges with power cuts in Malawi, he has chosen a 12 volt incubator which works from the mains but can also work with a car battery. I’ve been learning about quails – it takes 14 days to hatch the eggs and then you rear the birds for six weeks. Moussa has been raising 500 quails every 8 weeks but he has a long term goal of 5,000: I think he will get there! With the help of all our wonderful supporters we hope to support many more young people like Moussa and Hippo in the years ahead.